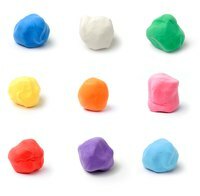 Sculpey nontoxic polymer clay, manufactured by the Polyform Products Company, can be used by kids and professional artists alike. Sculpey products do not require the use of a kiln. Instead, Sculpey creations are hardened by oven baking. Sculpey baking times and temperature vary based on the product. The times here are per 1/4 inch thickness of clay. You can bake Sculpey clay in a toaster oven. Avoid, however, baking clay in a microwave oven because it produces uneven heating. Place the finished clay piece on a glass or metal baking sheet. If you plan to use this baking sheet to cook food in the future, put a piece of cardboard (glass pan) or aluminum foil (metal pan) under your piece. Unbaked clay can stain, so keep it off of unprotected surfaces. Set the oven to the recommended baking temperature for your Sculpey product. Check the temperature with an oven thermometer to ensure accurate heating. Do not set your oven higher than the recommended temperature, because this can burn your clay piece. Sculpey clay produces irritating fumes when burned. Before placing your finished clay piece into the oven, do a prebake test, as recommended by the manufacturer. Shape a small disc of clay into a disc 1/2 inch in diameter and 1/4 inch thick. Bake it for the recommended time and the temperature for the clay product. Remove the piece from the oven and check its color. If some areas are much darker than others, lower the oven temperature by 10 degrees Fahrenheit and repeat the test. After checking the temperature, place your clay piece in the oven on the baking sheet. Run the oven's hood fan to ensure adequate ventilation. Although Sculpey is nontoxic, it can produce an odor during baking. Bake the clay for the recommended time; do not overbake. Remove the clay from the oven and allow it to cool. Use baby wipes to clean off your working space. If the clay did burn accidentally, clean out your oven. Keep your baked clay out of direct sunlight, as this can cause its color to fade over time. Do not use chemicals to clean clay pieces; gently wash them with soap and water. Most clay pieces can be cleaned by light dusting.